In the days now long past British Navy Sailors enjoyed a daily ration of Rum, also known as a Tot. The Rum was issued by the Purser, a ship's supply officer, who was called Pusser in slang by the Navy sailors, thus, the name Pusser's Rum, e.g. the Rum given out by the ship's supply officer. The tradition of daily rations, which, prepared the sailors for a face-off AND eased the pain of defeat, was one of the longest-established traditions in the British Navy, lasting from 1655 until 1970. The last Tot of Pusser's was drunk on board Their Majesties Ship on July 31st 1970, on, what is now known as Black Tot Day. In 1979, almost a decade after the Black Tot Day, Charles Tobias obtained the rights to blend the naval Rum, and formed the company to distil the Rum according to the original Admiralty recipe. Over the decades Pusser’s Rum has become a favourite of many a Rum aficionado, especially, because it shares certain characteristics with a Single Malt Scotch. One of their more recent expressions is Pusser’s 15 Year old Rum. It's a blend of Rums from Guyana and Trinidad, produced in century-old wooden stills, which heavily influence the blends, thus following an essential recipe instruction for a Navy Rum. Pusser's Rum is fermented naturally in open vats, where yeasts inherent in the environment ferment the sugar. Fermentation time takes 72 hours, and is done in three stages. This process adds to the finishing quality of the Rum. 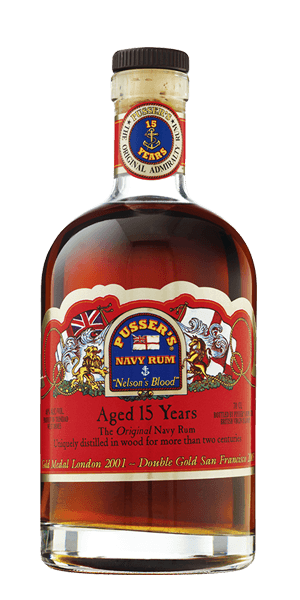 What does Pusser's British Navy Rum 15 YO Nelson Blood taste like? The Flavor Spiral™ shows the most common flavors that you'll taste in Pusser's British Navy Rum 15 YO Nelson Blood and gives you a chance to have a taste of it before actually tasting it. leather, tobacco, dried sultanas, toffee, cedar wood, spicy vanilla oak.